The strategy of high growth, aggressive deposit & loan rates, and low margins is sustainable. With new management since 2010, RBL is in a Grand Revival and a good business trajectory. Key risks: Rural slowdown in Maharashtra and intense competition in BFSI sector. Here is a note on RBL Bank Limited (RBL). Shares offered to public are 5.39 cr. of Face Value: Rs.10. The IPO offers 14.58% of the post IPO equity base, including OFS from shareholders (1.69 cr. shares) and fresh issue (3.7 cr.). Fig 4. Objects of the issue are – 1) Two existing PE funds and several smaller investors exit with Rs 380 crores 2) Rs 833 cr. will augment RBL’s Tier-I capital base to meet future capital requirements, loans/advances & investment portfolio, and compliance with Basel III norms and RBI guidelines. RBL is a Kolhapur (Mah.) based private sector bank with operations in 16 states and UTs. Total Income in FY16 was Rs 3,235 cr. and Profits were Rs 292 cr. RBL topline and PAT has grown CAGR 57% and 45.6% respectively over the last 5 years. It offers banking to companies, SMEs, agricultural, retail and low-income customers, Fig 1. It has 3,871 employees, 201 bank branches & 365 ATMs. See Fig 3. RBL has a 73-year operating history. They have transformed in the past 6 years with a new management, from a traditional to a ‘new age’ bank. RBL has expanded presence across India through a new network of branches and ATMs, and upgraded the delivery channels with modern tech-enabled channels like phone banking, internet banking and mobile banking. RBL’s business segments consist of corporate and institutional banking (C&IB), commercial banking (CB), branch and business banking (BBB), agribusiness banking (AB), development banking and financial inclusion (DB&FI) and treasury and financial markets operations. RBL’s capital adequacy ratio (CAR) was 12.94% compared to the RBI mandated CAR of 9.625%. The minimum CAR will increase from 9.625% (FY16) to 11.5% (FY19); an increase of 0.625% every fiscal. In addition RBI requires banks to have an additional capital buffer for absorbing risks so the capital requirement for FY17 would be around 12-12.5%. SEBI had provided a conditional go-ahead for the IPO of RBL. It had violated the Companies Act when it made 2 rights issues, allotting shares to 2,591 investors (Feb 2003), and 1,969 (Mar 2006). As per the earlier Companies Act of 1956, an unlisted company is not allowed to allot securities to more than 49 investors in a financial year. In order to fast track the IPO process, RBL has given the exit option to its existing shareholders via buyback offer. RBL is looking to grow 10% above the industry average. Under the new leadership during the last 5 years, deposits and loan book rose 20 and 8 times to Rs 17,099 cr. and Rs 14,450 cr. resp. The operating profit rose 19 times from Rs 19 cr. to Rs 360 cr., and the customer base jumped from 1.5 lakhs to 17+ lakh currently. RBL Bank is aiming for a 1 crore customer base by 2020. RBL launched an exclusive branch for start-ups in Bangalore. It was launched to assist entrepreneurs in setting up new companies/enterprises and offer banking services like FOREX, remittances, cash management and other value-added services with affiliates and partners. Beacon and GPE are the only category 2 (PE) selling shareholders in the proposed IPO. In FY14, RBL bought the credit card & home loan groups of RBS India, with 1.2 lakh customers. The loan portfolio is Rs 21,229 crores. We can see that RBL has a diversified loan book. Fig 5. RBL had signed up with IBM for their MobileFirst Platform to build, deploy and manage applications to improve the customer experience & stickiness, and employee engagement. Strategy: RBL, with 60% branches in rural and semi-urban areas, is well-suited to serve the bottom of the pyramid where a slew of new payments banks and small finance banks are also expected to operate. In the past, RBL hired talent from microfinance companies for self-help group, joint liability lending and micro-lending businesses. It also has an expert team for rural agriculture, which involves lending for drip irrigation, cultivation, warehousing and transportation. Personal Visit: A visit to RBL Bank branch was useful. The bank was on a main road, and visibility & location were excellent. The branch layout was good. The sales rep. was polite and helpful. All queries were addressed and there was an effort to cross sell other related products. The bank FD rates were attractive, and overall the urban bank branch had a high-end appeal. Perhaps in future we may become customers ….. The Indian banking sector remains under-penetrated in comparison to other countries. Even though banking industry has increased reach and scope, there is unmet demand for services. Only 40% of the adult population (45% urban and 32% rural) had bank accounts in 2014. Indian banking grew at a healthy pace, as deposits with banks grew at 16.6% CAGR during FY 07-15 to reach Rs 89 lakh cr. But growth slowed to 10.9% (Mar’15) from 14.6% in Mar’14. Deposit accounts with banks per 1,000 adults increased from 734 in 2012 to 1,358 in 2014. Banking assets increased 14% CAGR from Rs 40.7 lakh cr. (Mar’11) to Rs 68.7 lakh cr. (Mar’15). There was a slow growth in the balance sheets of banks witnessed over FY11-15, mainly due to tepid growth in loans and advances at below 10%. Investments also slowed. The decline in credit growth reflected a slowdown in industrial growth, poor corporates earnings growth, risk aversion from banks due to rising bad loans and governance related issues. RBI & GoI are setting up new policies to expand and strengthen banking infra. Banks in India need to capitalize on these to support economic activity and meet financial needs of all sections of society. PSB’s NPA problem: The PSB loans write-offs jumped sharply in recent years, with the state-owned banks writing off the highest-ever amount of Rs 59,547 cr. in FY16. State-owned banks’ gross NPAs by end FY16 were Rs 4.77 lakh cr. or 9.32% of the total advances. RBI has estimated that this ratio may rise to 10.1% by Mar 2017. PSB’s have recorded NPAs across the board, with corporate loans having for NPA of 11.95%, MSE had 11.13% and agriculture and allied were 6.39% of advances. Recapitalisation of PSBs: The govt. proposed a recapitalization plan for the PSB’s to infuse Rs 25,000 cr. in FY16-17, followed by Rs 10,000 cr. each in FY18-19. This is aimed at shoring up the PSBs lending capacities, currently restricted by poor asset quality and weak capitalization. Moody’s has said that the 11 PSBs would need capital of about Rs 1.2 lakh cr. until 2020. Market share: PSBs account for about 70% of the total banking system assets, down from 75% a few years ago. Robust growth for aggressive private banks happened in parallel to weakening of PSBs. Payment Banks: The RBI in Aug 2015 granted approval to 11 entities to open PBs. PBs are tech enabled new stripped-down banks that will reach customers mainly through mobile phones rather than bank branches. PBs will provide basic savings, deposit, payment and remittance banking services, and will target like migrant workers, low-income households and tiny businesses. SFBs: In Sep 2015, the RBI granted approval to 10 entities to convert to small finance banks. The aim was to upgrade microfinance firms. SFBs would be similar to the existing commercial lenders and can undertake basic banking activities of accepting deposits and lending. The GoI and RBI have created a policy and regulatory framework for MFI to operate in the country, by setting up MUDRA for refinancing and regulating the MFI sector. All universal banks (including RBL) are of course free to offer similar services as PBs and SFBs. Given the large market share of PSBs, their structural issues, capitalization challenges and high NPAs we feel there is a permanent market share shift taking place to private sector banks & NBFCs. Dynamic banks & NBFCs are seeing ample scope to grow business and provide banking services. The banking industry is a proxy to the overall economy, and one can expect, as a thumb rule, the industry to grow at 2-3 times the GDP growth. The Indian GDP is growing at 7% and this should improve over the next few years. Basis this, the sector should grow at 14-16% p.a. 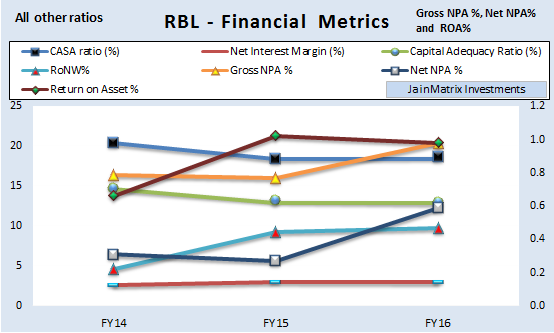 RBL Total Income, Net Interest Income (NII) and PAT/EPS have grown 57.0%, 56.1% and 45.6% CAGR over the last 5 years. These are very high growth rates. See Fig 6. Profit margins have not suffered during this growth, and have recovered to 9%. 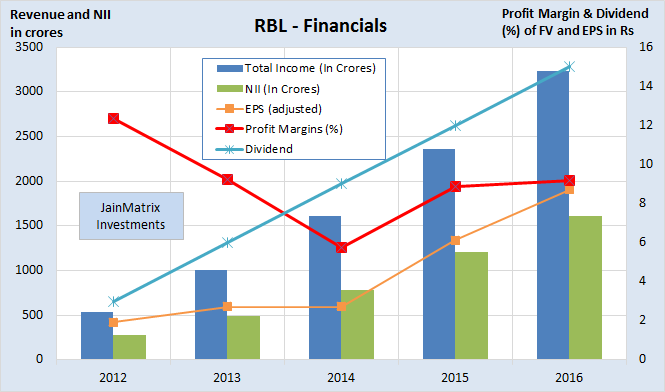 RBL has been paying dividend and also increasing this every year, a good sign. The dividend rate has improved over the years from 3% to 15% on FV Rs 10. The dividend yield is still low at 0.07%. In Fig 7 we map financial metrics of RBL over 3 years. NIM’s have improved marginally and the CAR has fallen marginally. The IPO proceeds should arrest the fall in CAR ratio. ROA and RoNW is low. However RoNW has improved sharply in the last few years. The Gross NPAs to advances were 0.98% and Net NPAs were 0.59% for FY16, these look OK. CASA is low. We compare RBL with peers in the banking space (See exhibit 8). RBL leads on 3 year sales growth and 3 year PAT growth. The P/E, P/B and net NPA’s are in the mid-range amongst its peers. RBL has the lowest margins among peers. It also has the lowest RoE in the industry. But this has risen sharply in 2 years. Dividend yield is low, but growth in dividend rate is also good. PAT margin at 9.04% is the lowest among its comparable peers. Our conclusion is that RBL is combining high growth and low margins. This is in sync with reports that RBL is addressing the semi urban and rural markets. It can prosper as a low-cost leader. RBL is focusing on niche high growth areas. In the semi-urban and rural areas it has a MFI, agro and small business approach. In Bangalore, it has a start-up focused branch for new entrepreneurs. The greatest potential sector within Indian BFSI is microfinance. RBL has focused sharply on the rural sector to combine high growth and low cost leadership. This is a sustainable success strategy. The financials growth rates have been good over the last 5 years. Given this growth rate, the valuations of the IPO of a P/E of 25.9 and P/B of 2.45 do not look excessive. With almost 50% of its 202 branches in Maharashtra, it has a high regional focus and visibility. Mah. is one of the fast progressing, high potential states and RBL is well placed in this region. RBL has a good management team of experienced banking executives built since its 2010 revival. Mr. Vishwavir Ahuja is a post-graduate diploma from IIM-A and has about 35 years of experience in BFSI. The second rung of management too is impressive. RBL uses M&A to grow rapidly. This can be a good means as long as they do not overpay for assets. Successful acquisitions lead to faster growth and improvement in bottom-line. Banking sector is competitive, with 120+ banks – PSBs, MNC & private Banks, SFBs, PBs, etc. RBL has a concentration risk with exposure to certain industries, and if such sectors experience any sustained difficulties then RBL business would suffer. There are 3 sectors with >5% exposure, see Fig 5. RBL has a concentration risk in loans to customers. 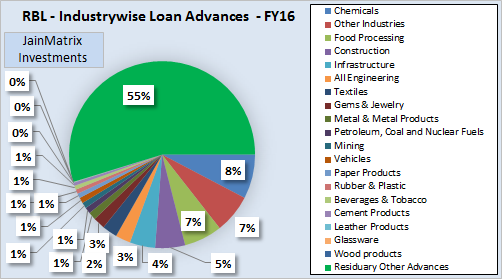 Loans advanced to 20 largest borrowers were Rs 4,635 cr., representing 14% of advances. However this to be expected in a small bank. Inorganic growth involves a number of risks. Additionally many M&A opportunities may be overpriced or of over-hyped assets, something RBL has to be careful about. The 45-57% CAGR growth in financials over last 5 years may be unsustainable over the next 3 years as RBL has transitioned from small to midcap. Post IPO we expect a 28-40% growth. Our economic outlook is that India is recovering from a 2013 bottom in terms of GDP growth, with lower inflation, lower CAD & fiscal deficit and stable rupee against foreign currencies. However a continued recovery depends on the government policies, good execution and governance by RBI. RBL is an aggressive player that has entered several new potential sectors and can make mistakes that can affect the growth trajectory and brand. RBL is quite rural focused. India is recovering from 2 consecutive drought years that slowed rural demand. This year so far the rains have looked good. However good rains for the rest of this season remains an uncertainty that can affect rural farming output and demand. RBL operates in a highly regulated banking industry and any changes in the regulations or enforcement initiatives may adversely affect their business. RBL is operating in a good environment of falling interest rates. However recently CPI and WPI index rose to outside the comfort zone of RBI, which may trigger a reversal of this environment. RBI has performed well over 3 years under the leadership of Raghuram Rajan. With his term at an end, we worry that in future RBI may not continue successfully on the reform & improvements, rupee defending and inflation control path seen so far. India remains underbanked and in fact a number of NBFCs, MFIs and dynamic private banks are seeing an amazing growth in recent years, trying to fill these spaces. Private banks will grow fast and gain market share over PSB’s in a growing economy. RBL has a good record of business so far in terms of growth, nimble business focus, and differentiation. The strategy of high growth, aggressive rates and lowest margins is sustainable. Given the high growth, in terms of valuations, RBL is not expensive. However there is not much on the table for immediate gains. Since the new management took over in 2010, RBL has seen A Grand Revival and entered a good business trajectory. The key risks are rural slowdown in Maharashtra and high competition in the BFSI industry. The IPO is rated a medium risk, medium return offering. This document has been prepared by JainMatrix Investments Bangalore (JM), and is meant for use by the recipient only as information and is not for circulation. This document is not to be reported or copied or made available to others without prior permission of JM. It should not be considered or taken as an offer to sell or a solicitation to buy or sell any security. The information contained in this report has been obtained from sources that are considered to be reliable. However, JM has not independently verified the accuracy or completeness of the same. JM has no known financial interests in RBL Bank or any related group. Neither JM nor any of its affiliates, its directors or its employees accepts any responsibility of whatsoever nature for the information, statements and opinion given, made available or expressed herein or for any omission therein. Recipients of this report should be aware that past performance is not necessarily a guide to future performance and value of investments can go down as well. The suitability or otherwise of any investments will depend upon the recipient’s particular circumstances and, in case of doubt, advice should be sought from an Investment Advisor. Punit Jain is a registered Research Analyst under SEBI (Research Analysts) Regulations, 2014. JM has been publishing equity research reports since Nov 2012. Any questions should be directed to the director of JainMatrix Investments at punit.jain@jainmatrix.com. Source for Data – RBL Bank Ltd – RED HERRING PROSPECTUS dated August 4th, 2016, company website, news reports, etc.